Some very stony and flinty aromas with graphite. Red and dark plums, too. Smells fresh and very complex already. The palate has great density and a fine, compressed tannin texture, as well as a very focused finish. Spiced black cherries and blackberries, cassis and dark chocolate to close. Short carbonic maceration and juice is racked off during the carbonic process. 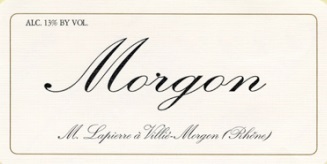 A captivatingly powerful but focused Morgon. No Côte du Puy due to the hail in 2017. Best from 2020.